We offer four types of Educational & Training Services depending on your specific requirements. We are a registered provider and sponsor for P.E.’s Professional Development Hours (PDH), as approved by The State Education Department of New York and The National Council of Examiners for Engineering and Surveying (NCEES) under the Registered Continuing Education Providers Program (RCEPP) for all other states. In today’s global digital economy and 24/7 business operations, mission critical systems are at the forefront of concerns among both private and public operations. 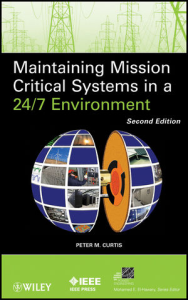 This book, authored by PMC President and CEO Peter M. Curtis, is an invaluable resource for architects, property managers, facility managers, building engineers, information technology professionals, data center personnel, and electrical and mechanical technicians. Power Management Concepts, LLC (PMC) is dedicated to bringing unsurpassed excellence to the Mission Critical Facilities Engineering Industry. We provide best-in-class Mission Critical engineering and consulting services that improve operations, reduce downtime, and promote energy efficiency while reducing greenhouse gases.